Procap 20 Capsule: Each capsule contains Omeprazole BP 20 mg as enteric-coated pellet. Procap 40 Capsule: Each capsule contains Omeprazole BP 40 mg as enteric-coated pellet. Benign gastric and duodenal ulcers including those complicating NSAID therapy, erosive reflux oesophagitis and for disorders associated with hypersecretion of gastric acid, such as the Zollinger-Ellison syndrome. There are no known contraindications to the use of Procap (Omeprazole). When gastric ulcer is suspected, the possibility of malignancy should be excluded before treatment with Procap (Omeprazole) as treatment may alleviate symptoms and delay diagnosis. Benign gastric and duodenal ulcers including those complicating NSAID therapy: 20 mg daily for 4 weeks in duodenal ulceration or 8 weeks in gastric ulceration. In severe cases the dose may be increased up to 40 mg daily. Healing of reflux oesophagitis: 20 mg daily for 4 weeks, followed by a further 4-8 weeks if not fully healed; 40 mg daily has been given for 8 weeks in reflux oesophagitis refractory to other treatment; may be continued at 20 mg daily. Zollinger-Ellison syndrome: Initially 60 mg once daily; usual range 20-120 mg daily (above 80 mg in 2 divided doses). Larger doses of upto 180 mg daily in divided doses may be used or as prescribed by physician. In patients with duodenal ulcer, gastric ulcer or reflux oesophagitis where oral medication is inappropriate, Omeprazole 40 mg IV once daily is recommended. In patients with Zollinger-Ellison syndrome the recommended initial dose of Omeprazole given intravenously is 60 mg daily. Higher daily doses may be required and the dose should be adjusted individually. When doses exceed 60 mg daily, the dose should be divided and given twice daily. Dose adjustment is not needed in patients with impaired renal function. As plasma half-life of Omeprazole is increased in patients with impaired hepatic function a daily dose of 10 - 20 mg may be sufficient. Elderly : Dose adjustment is not needed in the elderly patients. Children : There is limited experience with Omeprazole IV Injection in children. Procap (Omeprazole) is well tolerated. Nausea, diarrhea, abdominal pain, pruritus, dizziness and headache have been stated to be generally mild and transient and not requiring a reduction in dosage. Pregnancy: There are no adequate and well-controlled studies on the use of Omeprazole in pregnant women. Omeprazole should be used during pregnancy only if the potential benefit to pregnant women justifies the potential risk to the fetus. Lactation: Omeprazole is excreted in breast milk, but is not likely to influence the child when therapeutic doses are used. Omeprazole can delay the elimination of diazepam, phenytoin and warfarin. Reduction of warfarin or phenytoin dose may be necessary when Omeprazole is added to treatment. There is no evidence of an interaction with theophyllin, propranolol or antacids. Procap 20 Capsule: Box containing 10 x 10 capsules in blister pack. 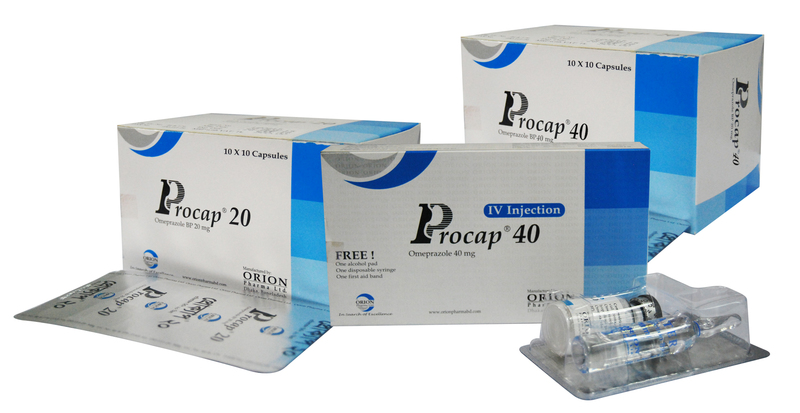 Procap 40 Capsule: Box containing 5 x 4 capsules in blister pack. Procap 40 IV Injection: Combi-pack containing 1 vial of 40 mg Omeprazole, 1 ampoule of 10 ml WFI and 1 disposable syringe (10 ml/cc) with an alcohol pad and a first aid band.